Josh Erwin is from Austin, Texas and attended The University of Texas and Texas Tech University School of Law, where he was class president for his second and third years of law school. While at the University of Texas, Josh studied abroad in Tel Aviv, Israel, and Guanajuato Mexico while in law school. After law school, Josh was a prosecutor in Caldwell County, Texas for District Attorney Charles Kimbrough and later practiced plaintiff's law with Broadus Spivey and Price Ainsworth. In 2007, Caldwell County District Attorney Trey Hicks offered Mr. Erwin the First Assistant District Attorney position in Caldwell County, which he held for five years. Mr. Erwin has tried every level of criminal case and has extensive criminal and civil trial experience, and prides himself on his trial preparation and performance at trial. Mr. Erwin is an aggressive litigator who will fight for your rights and provide you with excellent representation. Mr. Erwin was accepted into the State Bar of Texas in 2000, and is licensed in the Northern, Western, Southern, and Eastern United States District Courts of Texas. Mr. Erwin is also a member of numerous bar associations and is currently the Vice President of the Caldwell County Bar Association. 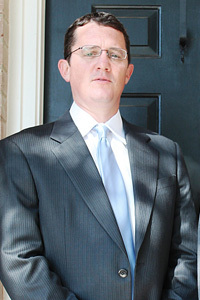 In 2004, Josh was named a "Rising Star" Attorney by Texas Monthly magazine. Josh and Amanda make their home in San Marcos, where he enjoys gardening, hiking, and swimming in the beautiful San Marcos River. Amanda Erwin grew up in Houston, Texas and attended the University of Rochester in Rochester, New York for her undergraduate education. 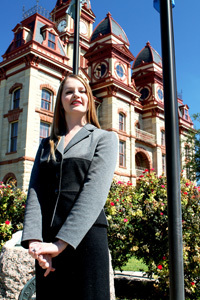 Amanda, eager to return to Texas, attended The St. Mary's University School of Law on the Dean's Scholarship. During her law school career, Amanda was a member of The St. Mary's University School of Law External Moot Court Team, in which she participated in a multitude of state and national competitions and achieved countless awards. Upon graduation, Amanda was awarded with the St. Mary's University Outstanding Moot Court Award out of her entire graduating law school class, and was also inducted into the prestigious national trial advocacy organization, The Order of the Barristers. Amanda, passionate to utilize the trial skills she had acquired during her education, accepted a job at the Caldwell County District Attorney's Office in January of 2007. This is where she met her husband and law partner, Josh Erwin. Upon leaving the District Attorney's Office, Amanda had risen to a felony prosecutor who handled all of the sexual and violent crimes against woman, children, and the elderly, and was also head of the Appellate section. Amanda has tried an extensive number of juvenile, misdemeanor, and felony cases, as well as written numerous appellate briefs and argues before the Austin Court of Appeals. When she is not vehemently defending the rights of persons accused of crimes, or assisting family law client's through their hardships, she enjoys gourmet cooking, theatre, traveling, and the outdoors. We are also members of: The Hays County Bar Association, The Caldwell County Bar Association, Friends of The Fine Arts and Communication, Texas State University, and The Order of the Barristers. NOTICE PROVISION - Please read this notice before contacting The Erwin Law Firm, L.L.P.